The Breadboard | Come join us for breakfast or lunch! Welcome to the Breadboard Restaurant in Ashland Oregon. We serve only the finest local ingredients and cook each item to order. 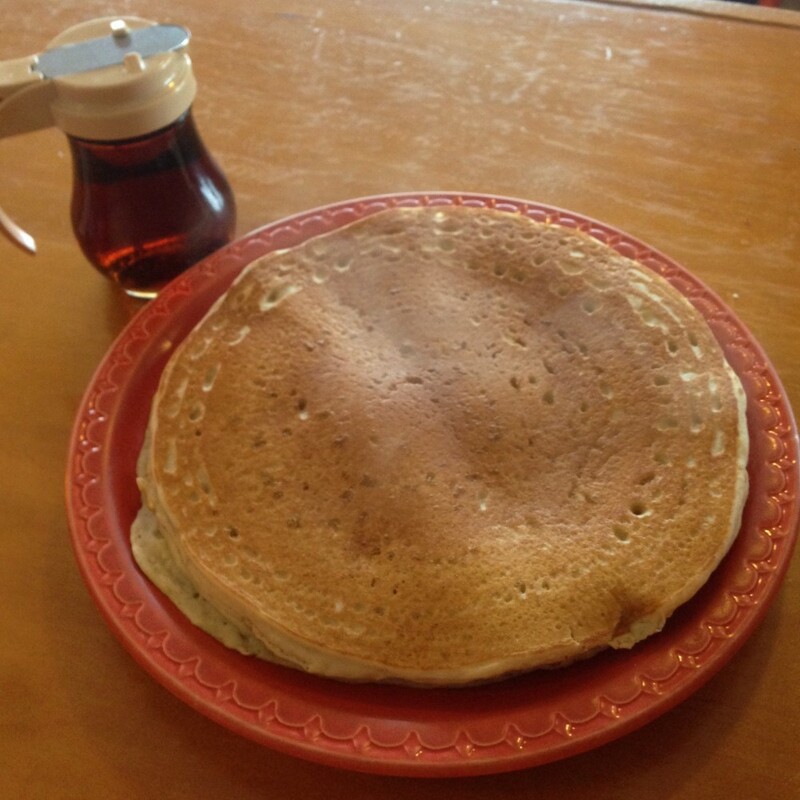 Now serving Gluten Free Pancakes! I was having breakfast at the Breadboard and there are so many great choices I didn’t know what to do and then this couple at the table next to me was having this conversation and the woman was trying to explain something to this man and he said he just wasn’t getting her point because she was talking so fast but she told him he was, as usual, he was just listening too slow. They were sort of having this argument about who was the best James Bond. She was saying that she’d just watched “Dr. No” with Sean Connery 3 times in a row and he was without question the best Bond ever. But he was a Daniel Craig fan. She kept saying that his defense was built mostly around special effects and modern cinematography and improved editing and less about the character himself and then she cited this study from Stanford in 1970 that documented the counterintuitive phenomenon that when facts prove someone wrong, instead of changing their mind, people tend to double down on their false belief. Thankfully, breakfast arrived just in time because they were starting to get pretty fired up. The food is just so good at the Breadboard – good enough to bring peace to the table when the big issues just can’t seem to be resolved. The thing everyone agrees on is that the Mountain Man at the Breadboard is a classic. 35 years and still an Ashland favorite. Never goes out of style. There’s probably a study done by Stanford that explains the peace-making effect of the Breadboard Mountain Man, and the woman next to me has probably read it and I was going to ask her about this but then a guy next to me started talking about the Roger Moore James Bond (talk about counterintuitiveness and false beliefs) and and I started to flip out not yet having had my Mountain Man but thankfully, just in time they delivered my warm Marionberry muffin and all was copacetic. 35 Years of Yummy Food and Awesome Service!!! “Then in 1982 a guy dressed up in a Spiderman costume got on top of a Greyhound bus that was driving through town, and we became real concerned about safety,” said City Councilor Susan Reid. That was a quote from the first issue of Sneak Preview in 1990 regarding the Halloween situation in 1982. Shortly after that two guys who were selling wood stoves decided to cut their losses and start selling sandwiches and Ashland Wood Stoves changed its name to The Breadboard. The “rest of the story” is that Ashland was barricaded on Halloween for a time and Spider-Man sightings stopped but the Breadboard never slowed down. 2,643,231 meals later (est.) and the big question seems to be why it is called the Breadboard? Good question. A good goal for 2018, search for the meaning. Get up early. Eat at the Breadboard every day because it’s been there for 35 years and while you sit there enjoying your delicious omelette or Kristal’s Killer Chicken Sandwich, gaze out the window and who knows, maybe Spider-Man will pass by on top of a bus. A perfect beginning to 2018. “Maman died today.” It’s supposedly one of the most famous lines in literature. As I sit in the Breadboard savoring a piece of perfectly cooked thick sliced bacon I am intrigued by the conversation next to me. Somehow the discussion has veered from the literary merits of one of the most famous openings of a novel to a heated dispute over the pronunciation of a name. “It’s French – like ‘Al – bear’ – not just ‘Albert’ like the Beatles’ uncle!” And this person is really fired up. “How do you know?” “Because I googled it!” Well, there you go. A paradigm shift. Not because of the AP English teacher that forever changed my life – nope. This person knows literature because of Google. Who needs AP English when you have Google? The dreaded instant authoritative Google expert – the seed of smartphones and the internet. All of a sudden, someone who doesn’t really read literature can pronounce and even lecture on Camus. Or someone who doesn’t even like jazz can spell and pronounce say …. Django Reinhardt. They’ve never even appreciated “Honeysuckle Rose” but they know all about Django’s burned hand and his tumultuous gypsy life and they’ve never worn a beret and can’t play guitar. I mean, OK, really… I don’t really think the decline of western civilization started with googling, but I do think that instant Google experts maybe should be put in solitary confinement on a restricted diet – no Breadboard bacon, or some other form of effective rehabilitation. Honestly though, there’s a balance. For example, I’ve always been bothered by people who think George Gershwin’s “Rhapsody in Blue” was written by the ad agency for United Airlines. But that was almost pre-internet and a well-known classic long before the United marketing campaigns. In all fairness, I can’t blame Google or the internet. I mean, without the internet only a few people would get to appreciate the United slogan, “If we can’t beat our competition, we’ll beat our customers.” Or what about Emoji’s? Fun. Useful. They can add humor and warmth to an impersonal text. But they are teaching people how to not write… how not to write? . So many issues occupied my mind but my bacon was so good that I settled into a meditation on the grace of simplicity.. But I must have been thinking out loud because the Google addict next to me overheard me and googled “grace of simplicity” and a whole new extended period of philosophical pontification based on Google “facts” was off to a running start and I asked for another delicious cup of better not bitter Goodbean coffee and smiled to myself and settled in for the ride. Life is lyrical – love you maman. Happy? Sad? Confused? Stressed out? EAT. And I kept painting and painting but the billboard was on the side of a bus so I had to run alongside the bus as I was painting and the bus kept going faster and faster. I don’t know what this was all about. This is why I tend not to over analyze my dreams. But one thing was clear when I woke up – I headed straight to the Breadboard and I was there when they unlocked the door at 7. The other day I was chowing down on a delicious Greek omelette at the Breadboard totally immersed in a kind of meditative nirvana and it reminded me of an ancient Taoist fable about this guy named Chuang Chou who dreamed he was a butterfly happily flitting about and the dream was so real that when he woke up he wasn’t sure if he was Chuang Chou or he was actually a butterfly dreaming he was Chuang Chou and while contemplating the transformation of things it made me think of the confusion I was experiencing because I couldn’t distinguish between the deep sense of joy I was feeling savoring the memory of the first half of my meal which I’d just eaten or the excitement I was feeling with the giddy anticipation of eating the second half and I just kept eating and eating and eating and then the little girl at the table next to me blurted out “Mommy, that person eats like a horse” and she reminded me of the old story about the woman that bought a horse without her husband’s knowledge and she was trying to find a place to board the horse and the first guy arrogantly snapped that he’d charge $80 a month and the vet bills would be extra and he’d get to keep the manure and that seemed unacceptable and she was slightly offended so she went to a second barn and the guy said he would charge $70 plus vet bills and he gets the manure but that wasn’t much better so she went way out in the country and the third guy was really laid back and said he’d charge $30 a month with no vet bills and she asked what about the manure and he said that at $30 a month there wouldn’t be any manure and as I was eating and eating and eating and experiencing this deep sense of satisfaction my mind just kept blissfully wandering and wandering and wandering and I never ever ever ever wanted my meal to end. Yummy choices every day – sweet or savory! I’ve been contemplating part of a conversation I overheard the other day while enjoying a delicious meal at the Breadboard. A younger nicely dressed and dignified woman was talking to these two businessman-looking guys and I kind of started eavesdropping in the middle of some story where she said “Once I was blading out a corral of replacement heifers – ” And then I was interrupted by a cheerful server who wanted to know if I was ready to order and I missed the point of the woman’s story because my attention was diverted back to my original dilemma of trying to decide between a sweet or a savory special because that’s something I love about the Breadboard – they change their specials daily and they always have something sweet like a yummy stuffed French toast or a crepe AND they always have something savory like a veggie frittata or a creative scramble so I’m always satisfied no matter what my mood is each day – and I can be moody – but anyway, I digress – about those replacement heifers – it’s not something I hear mentioned in Ashland often – well, never actually, and it sort of sounds a little dark and I don’t know what she was talking about but when I re-entered my eavesdropping mode she was saying that she had realized that if she did her own yard work for one hour a week she could save herself $30 a week and she can totally stuff herself for $15 at the Breadboard so she decided to eat at the Breadboard at least once a week and do her own yardwork and she felt like she was actually making $15 a week. The business guys were intrigued by her conversation and seemed a little confused and one of the guys was scribbling something on a yellow pad and then he mentioned if she went to the Breadboard twice a week it was a break even proposition and I jumped in and mentioned that that was a great idea because then could have something sweet one day and something savory the next but I realized they weren’t too cool with me being part of the conversation and she mumbled something about “blading out” and it was a little awkward but the frittata that day was amazing and then the server crashed in and started talking about the soup of the day and who needs more coffee etc. and everything was fine. Congrats Grizz Class of 2017!!! … most especially Nikki! 我们爱你! There’s a rumor that Jim Belushi was recently seen having dinner at Thai Pepper. Apparently, because the Breadboard doesn’t serve dinner or really anything Asian – fusion – like, Mr. Belushi must have decided that’s was really his only option. I think that’s just fine and I applaud his good judgement. The food there is great. But I’m getting off the point… What’s really interesting is that everyone knows Mr. Belushi for his role in “Hoodwinked” as the Woodsman, which sort of prophesied his move to a cabin on the Rogue River. Even more significantly, long before “Hoodwinked” set the world on fire, in 1995, he starred in the enduring classic “Canadian Bacon” with John Candy and Rip Torn. The movie was directed by Michael Moore and it has a Rotten Tomatoes score of 14% but everyone knows real cinematic art never panders to the populist approval of Rotten Tomatoes. This is where a closer study of the man becomes really intriguing. Apparently, there’s a rumor that Mr. Belushi has actually never tried the Eggs Benedict at the Breadboard and that’s intriguing because the “canadian” bacon is really good in the Breadboard Eggs Benedict and the whole dish is, well, a classic – in a Hollywood blockbuster kind of way while giving a tip of the hat to our gentle neighbors to the north. And here, even more synergy emerges because the Breadboard crew are actually kind of like Canadians because they are really friendly, peaceful and unpretentious (except none of them are really into hockey but this is a minor diversion from prophetic fulfillment). Now, I know I’m rambling here, but I think there is a natural pattern emerging, a conversion of energy in an Ashlandy new age gestalt that revolves around the undeniable allure of one of life’s bucket list must things to do – savoring every delicious creamy bite of the classic Breadboard Eggs Benedict… with Jim Belushi, if possible. There is something different and wonderful about the Breadboard. Yeah, the food is yummy. The bacon is amazing. Everyone pretty much notices that stuff right away… But the thing that is really special is the crew. A lot of times customers aren’t really sure who the owners are – that’s because the people that work there all treat the place like they are the owner. Each “employee” feels like the Breadboard is “their” place and each one is personally committed to making everyone feel happy and at home. Combined, the staff has worked there for well over a century. Sounds like an exaggeration, but when you consider that Kerri has been there for 23 years, Jim for 15, Maria for 11 and many others approaching the decade mark – you begin to feel like there’s a reason people feel like family – because they are. One server who is approaching the 11 year mark is Patrick. He’s dealing with cancer right now. He’s going to beat it – but not alone – the whole Breadboard family is pulling for him. Here’s to Patrick. Please keep him in your prayers and thoughts. Go Team Patrick! Copyright © 2019 The Breadboard. All rights reserved.